Click here to read more about the Clipper Cove Way Detour Opening and TI Causeway Traffic Realignment. Click here to view TICD Construction Advisory for the Soil Haul Route Activation. This page contains information about on-Island detours, street closures, and impacts to traffic circulation and public transportation that are on-going during TICD Development Construction activities. This page is updated regularly as TICD on-Island construction activities progresss. Forest Road Detour road carries two-way traffic between Northgate Road and Hillcrest Road providing access to/from the new Westbound On/Off Ramps and United States Coast Guard. Macalla Road is closed to all vehicle, pedestrian and cyclist traffic between Northgate Road and Treasure Island Road. 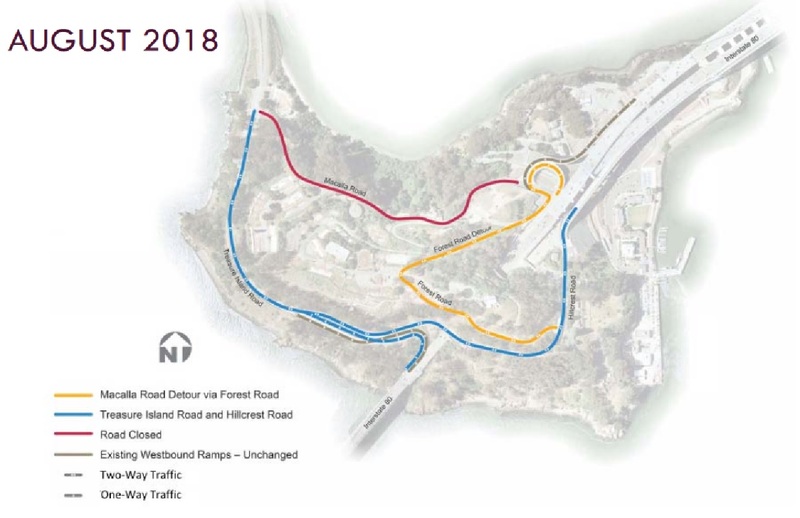 From Treasure Island, motorists wishing to reach the new Westbound On-Ramp east of the Bay Bridge tunnel, or other destinations on YBI, will need to take this Forest Road Detour road over the top of YBI to Northgate Road. No regular impact to the Bay Bridge YBI on-ramps and off-ramps. All other currently open YBI streets will remain open. Motorists and cyclists should expect increase in two-way traffic along Hillcrest Road. Motorists should expect additional traffic control and road work along Forest Road Detour road for the next several months after the initial August 20th opening. There are no bicycles or pedestrians allowed on the new Forest Road Detour road. There is no impact to the bicycle route between Treasure Island and the Bay Bridge pedestrian/bicycle path trailhead or the YBI Vista Point. Cyclists and vehicles will share the road through the impacted areas on Hillcrest Road and Treasure Island Road. No regular impact to the MUNI-25 Treasure Island bus route. Please drive safely on-Island at all times. Motorists and cyclists are reminded to Share the Road in the impacted areas! There are no impacts to the 25 route itself. Visit SFMTA.com to sign up for MUNI Alerts and recieve real-time and scheduled route alerts on your mobile device. With the closure of the Front Gate Parking/Viewing area and Treasure Island Road realignment, there is no longer available space for visitor parking and tour bus/charter parking, ilding, loading and unloading of passengers at the Front Gate area or along Avenue of Palms or Treasure Island Road. A new Visitor Parking Area south of 9th Street between Avenue B and Avenue of Palms (east of Mersea Restaurant) is now available for the safe loading and unloading of tour bus/charter passengers wishing to enjoy the view of San Francisco Bay. Tour bus and sightseeing charter vehicle parking, loading, unloading or idling is prohibited at all times in the Treasure Island Residential Neighborhood north of 9th Street .